I was having a good day today until the evening. I got up and took a nice hot shower, lotioned up with rose smelling lotion… gave myself a pedicure and painted my nails while I read in-between coats. I had some yummy cake my husband bought last night with an icy cold (diet, caffeine free) pepsi. Mmmmmmmmmmmmmm…. you know the diet pepsi cancels out the calories from the cake. Anyway, then I listened to music loud while doing some laundry and cleaning up. When my husband got home and I was talking to him a bit. Then I unloaded the dishwasher and that’s when I spotted the filter in the door and saw it had stuff on it. I remember Rebekah blogged about her dishwasher cleaning experience and took the filter off the door and cleaned it out. It was kinda gross but really just mineral deposit build up and some paper label stuff. My dishwasher is only about 6 years old. Then I was looking in the bottom to see if there was a filter in the bottom like Rebekah’s. I unscrewed this plastic screw thing to look under this round thing. My husband said I should make sure to keep track of how I took things off but it was too late. This seal thingy fell off when I picked up the round thing and I have no idea how it was on there. Anyway, I didn’t find a filter to clean but did find a bunch of random gross things laying around the edges of this round slotted section in the bottom…. I found a VERY nasty scrubby, a melted medicine cup, and some really icky food pieces…. Then when I put everything back on my husband thought I did it wrong so he got down there. He ended up breaking the plastic screw thing that holds everything together. The threaded part broke off inside the hole where it goes and he was really mad and said some WORDS and mentioned that the dishwasher wasn’t even broken. RARRRR! So I feel bad. I just ordered a new part (and printed a diagram showing I had it put together right in the first place) and although the part only cost $5 they don’t ship by USPS to Alaska. So $19 for priority shipping and this plastic screw piece is only about 2 inches and very light. I’m not very happy and not really feeling like talking to the butthead in the bedroom. Anyway, here is my Fill in the Blank Friday deal – Click here if you would like to join in the fun. 4. If I had to dress in one color for the rest of my life I would pick black, I can always accessorize. 5. If you were to look in my bag right now you’d find receipts, lip gloss, a medical remote, wallet, lots of cards that I’m not supposed to use, change, coupons, hair bands, a LOT of pens I stole, glasses and eye glass cleaning cloth, my fancy butterfly compact mirror. Anyway, about my wool-eater blanket I’m making…. 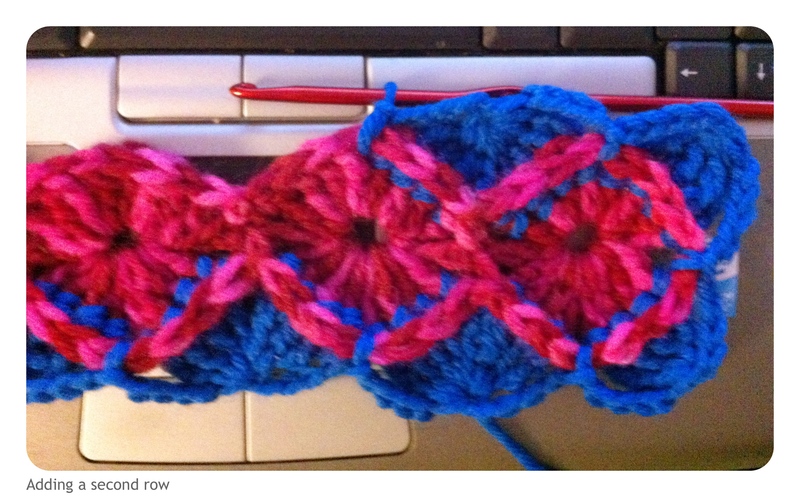 I don’t remember where I left off yesterday but this picture shows me adding the first row of the blue. The second row of blue is now finished completing the circles. I’m ready to start adding a new color but I am having a really hard time deciding what color to use. I’m trying to use yarn I already have – yarn that was donated for Project Linus – but it’s all so random. Some of it is probably from the 70’s and wouldn’t look good at all. I might go with some purple…. but I’m not sure… I actually started to add this mid-toned purple baby yarn with some green fun fur… it looked cute at first but once I got a full section finished the fun fur just made it all hard to see. I realized I made a mistake too and when I tried to take it out it got stuck. So I grabbed the scissors and I’m glad I didn’t go any further than I did. Fun fur is bad. Well I’m not sure which color will go next but it needs to be something bright I think……….but I do have some light pink that might pick up that lighter pink from the variegated yarn in the center. Hmmmmmmm Any ideas??????? I have a ball of this pretty sparkly blue/green variegated yarn but I don’t know if I’ll have enough to finish a row. I also have some red, orange, white, dark blue, green purple variegated, dark primary variegated, light pink….grey….brown…… oh and some red heart multicolored yarn in the monet color – it’s soft mid-value colors of purple, blue, yellow, green, blue, pink…. I really don’t know what I should go with next…. Here is my 365 Project picture for today. I was looking at a sweater I was knitting but had put aside for a while. It is wool-ease blush heather and I never really noticed all of the different shades of fibers in the yarn before. So apparently the NaBloPoMo prompt I used yesterday was actually today’s. If I blog later they already have put the next days up. Alaska’s time zone is 4 hours earlier than Eastern. Screws things up nicely. Tell us about your earliest school memories. I remember playing out on the playground and hanging upside-down from the monkey bars. Then this little girl I didn’t know came up and pulled me down on my head. It hurt and a big chunk of one of my molars broke off. I told the teacher but she just told me to quit tattling and go play. I showed her my broken tooth and she just said it was a piece of gravel and tossed it in on the ground so I couldn’t find it again. She told me to go play and quit whining or I would have to have a timeout. After I got inside I told another teacher about what happened and they actually made me apologize to the girl who did it for making up stories about her. When I got home I showed my dad my broken tooth and the bruises from where I fell and he went in there storming mad. That is when I learned my evil passive aggressive ways…. I used a baggy to pick up a soft dog poop and put it in her coat pocket. Donna, your earliest school memory is hilarious! You’re not alone, however, my first one involved me having to apologize for a name calling war that I didn’t start. “That is when I learned my evil passive aggressive ways…” ~ Love it! Oh my! Sorry about the dishwasher. What a fluky thing to happen anyways. I remember the “you started this” or “if you hadn’t…” arguments. Hope you figure out your crochet project.